The following cartoon really tickled my sense of humour. It was in Monday's edition of How to Geek. It took me a second to really see the funny side. 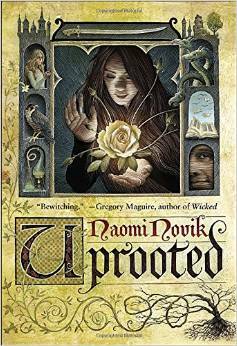 I have just finished reading Uprooted by Naomi Novik. I enjoyed all her Temeraire books about the fighting dragons taking part in the Napoleonic wars, the first book being Her Majesty's Dragon. Great story telling. However Uprooted is a different departure and more in the tradition of the story tales of old Europe. It sure didn't end the way I expected. In fact I found very little about the story to be predictable. One knew right from the start that she, Agneieszka, the heroine, would be chosen by the wizard known as the Dragon that was obvious from the blurb. But after that, nothing went as I expected. I enjoyed the book so much that I bought the Kindle version. The one I was reading was from the library. I really can't praise it highly enough, I was having trouble putting it down and going to bed. Made a nice change from some of the books I have read lately. Only trouble is, once you get to the end, you wish you hadn't. I went, Monday afternoon, and got my very last batch of asparagus. I bought myself an extra large batch. I may well freeze some more of it although it isn't as good, it's better than nothing. For some reason I have never been able to buy frozen asparagus round here. Used to get it in the States. I was going to buy some liquid honey too to save myself a journey later on, but they were out. If you get fresh honey there is a terrific difference to that which you buy in the grocery store. I forgot to mention, my doctor said I can't drive at the moment because of my carotid. Matt drives most of the time anyway. I should also emphasize that I am not unwell, apart from that apparent fainting fit and the odd dizziness which doesn't happen very often and could be caused by anything. This is the recipe I was going to post the other day and then couldn't find the picture for. I have now discovered how to export pictures from my cookbook file!! You may now find me in a corner crying my eyes out because the asparagus season is ended. Yes, I have bought store asparagus before now but only in extreme emergencies. But since I discovered Barrie's Asparagus Farm I have rarely used anything else, there is such a stupendous difference between farm fresh and store bought. For those of you who also like asparagus, I hope you have enjoyed this recipe journey. It, and my recipes, will be back next year. From now on we will be into more mundane foods. 1. Preheat oven to 450º F (230º C). 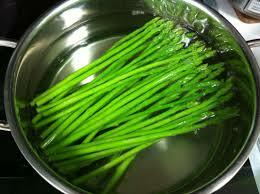 Steam or simmer asparagus just until tender-crisp, 3 to 5 minutes; drain well. Fill large skillet with water. Add vinegar and bring to simmer over medium heat. Slip eggs, one at a time, into simmering water; cook until whites are firm and yolks are just set. Remove eggs with slotted spoon and carefully blot dry with paper towel. (Eggs may be poached several hours in advance; transfer to bowl and cover with cold water. Drain well before proceeding.) Divide butter among 4 gratin dishes. Divide asparagus among dishes; drizzle with lemon juice. Drape proscuitto over top. Arrange 2 eggs on top of each prosciutto. Season with pepper to taste. Sprinkle cheese over top. Bake for 3 to 4 minutes or just until cheese melts. Serve immediately. Just over a week ago I had an ultrasound on my carotid artery. This was as a result of my fainting (for want of a better word) episode a few weeks ago. Saturday I went to see the doctor to discuss the results. It turns out that my carotid is 70% blocked on the left side. So now I have to go see a surgeon and I am guessing, have an angioplasty and maybe another stent. I already have two in my femoral artery. Guess that's going to interfere with my bowling. A friend told me she had an 85% blockage of an artery and they did the angiogram/angioplasty straight away. I hope they will get to mine quickly. Considering I have already had femoral arteries stented (new word) and now they find another major artery blocked, it makes me wonder what else needs attention. I was quite chuffed Sunday morning (pleased with myself) because I managed to catch two fruit flies; usually I can't get anywhere near them. We get lots of the damned things in the summer months (well they say it's summer) and last year some of you may remember I bought an apple which is actually a fly trap. It does work, but not brilliantly so we still get them flitting around the place. God forbid we should throw a banana skin in the garbage, they home on it almost instantly. We frequently spray Raid in the garbage can to stop them. We have had a plague of them in the bathroom before now and they seemed to be coming from the overspill hole. Luckily this has only happened the once. 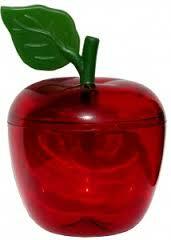 This picture shows an apple trap somewhat more ornate than ours. There is an attractant inside and a sticky ring of card to catch them. The idea is to put it with fruit. Would you believe there are only a few days to go now and I will stop posting asparagus recipes until next year. I will be getting my last asparagus on Tuesday and although I will be enjoying it for a while longer, I probably won't post asparagus recipes after June is out. In this irresistible, fragrant dinner, the flavors of French onion soup are combined with pasta and asparagus. It's a big hit in our family, and something even my picky kids will eat! 1. Melt butter in a Dutch oven or large skillet. Add onions, garlic, thyme and bay leaf; season with salt and pepper. Cover and cook over medium-low heat, stirring frequently, until onions are softened and caramel in color, about 30 minutes. 2. Meanwhile, cook pasta according to directions on package in boiling salted water. During the last 4 minutes of cooking, stir in asparagus spears. Drain pasta and asparagus; set aside and keep warm. 3. When onions are caramelized, stir in flour until coated. Stir in beef stock, scraping browned bits from the bottom of the pan. Heat to boiling, then reduce heat to low and simmer 10 minutes. Stir in heavy cream. Add onions and sauce to the reserved pasta and asparagus. 4. Spread the pasta in an oven-safe dish. Sprinkle with mozzarella cheese. 5. Combine olive oil and breadcrumbs; sprinkle evenly over cheese. I see in the news tonight (Friday) that one of the escaped convicts has been shot to death. 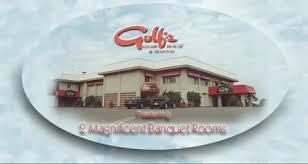 It is a very odd incident and one wonders just what part the arrested guards played in the escape. Here's something special for my last asparagus Saturday Recipe this year. I've got to see if I can get hold of any quail round here. I have been asked to help spread the word that Denise Covey and Yolanda Renée are bringing back the Write... Edit... 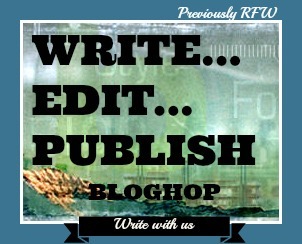 Publish... Bloghop. The big announcement will be on Denise's blog going live Monday night. This is the badge they are using. They are obviously hoping as many people as possible will take part. What a great idea. 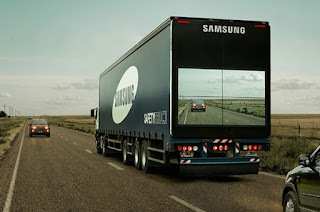 Samsung have introduced a Safety truck. The truck has a camera at the front which shows a picture on four screens at the back of the truck permitting a driver to see the road ahead and to know when to pass safely. Here is another Half Hour Meal. I have to say I think these recipes are a bit stingy on the asparagus. Salty ham, earthy asparagus, and tangy provolone serve as the filling for chicken cutlets in this quick and delicious recipe. The presentation is pretty enough for company, but the recipe is easy enough for a weeknight meal. 1. Heat an inch of water in a high-sided skillet until simmering. Add asparagus spears and sprinkle with salt. Simmer for two minutes. Set aside. 2. Meanwhile, halve the chicken breasts horizontally, separating each into 2 cutlets. Place the cutlets between sheets of plastic wrap or wax paper and pound to 1/8-inch thickness. 3. Arrange the cutlets on work surface. Season them with salt and pepper on the side facing up. Cover each piece of chicken with 1 slice of cheese and 1 slice of ham. Starting on 1 long side of the breast, place a bundle of 3 asparagus spears. Wrap and roll the chicken around the asparagus. Repeat with remaining 3 cutlets. Season the outside of the roll-ups with salt and pepper. 4. Heat the olive oil in a non-stick skillet over medium heat. When hot, add the chicken roll-ups to the skillet with the seam side down. Cover the pan loosely with foil and cook 4 to 5 minutes. Turn the roll-ups over and cook another 4 to 5 minutes, uncovered. Serve immediately. I was so involved in finishing a beta read for one friend and reading the novel written by another, I forgot to post this. This comes from Half Hour Meals and would certainly be very quick to throw together. A very simple and quick recipe. Good for lunchboxes, weekday dinners and picnics. 1. Trim woody ends from asparagus stalks and toss in olive oil, salt and black pepper. 2. Heat griddle pan until hot and cook asparagus on it until seared and cooked through. 3. In a separate pan, heat some water until boiling. Add some salt and cook pasta according to instructions until al dente. Drain and rinse under running water. 4. Cut heads off asparagus and slice the remaining into thin rounds. 5. Toss asparagus and pasta together with a good drizzle of mint oil, salt and pepper. Top with shavings of parmesan cheese. Monday night we had the oddest storm. It was lashing rain and flashing lightning but there wasn't one rumble of thunder. A totally silent storm. In the morning everything appeared dry but the greenery was so fresh looking. both finished up with dessert I had carrot cake, surprise, surprise, Matt had a chocolate swirl cheese cake. I drank a glass of Valpolicella, Matt usually refrains as he is driving. When we left there were all kinds of girls in pretty dresses running around the parking lot, figured it out as a prom, it was. All of the dresses were short and bouffant like a ballerina's. One somewhat buxom girl would have done much better wearing a different design. In something svelte she would have looked good. Most of the young men seemed to be wearing the same shirts in shades of lilac although one went as far as deep mauve. So, we have finally spent Matt's birthday money from his kids. This sounds like a soup I will be trying. Love pea soups but never thought of combining with asparagus. I think I would leave out the potato. A quick and easy soup recipe to celebrate the native asparagus season. I wanted to make a recipe that didn't include cream - there are a lot of those about! Heat the olive oil in a large pan over a medium heat. Sweat off the onion and the celery until soft, and then add the potatoes and the stock. Bring the stock to the boil and then simmer for 20 minutes or so. Add the peas and the asparagus and cook until the asparagus is tender. Add the herbs and turn the heat off. When cool enough, blend until smooth and then bring back to simmering point. Serve. I have planned recipes for the rest of June. I think for a bit I might take a break and huddle over my asparagus before it all disappears for another year. So my blog will post with a recipe alone unless I decide to add something at the last minute. I will continue to visit other people's blogs though. Just feeling somewhat tired. but maybe I will feel less so tomorrow. This is an unusual recipe for me, but hey, I'll try anything. This and some of the following recipes is from Half Hour Meals. Quick and easy for even your busiest weeknight, these sandwiches are an updated version of an old fashioned favorite. Full of flavor the whole family will enjoy! 1. Snap off the woody ends of the asparagus. Cook asparagus in boiling water to cover for 3 minutes, or until crisp-tender. Drain. Quickly rinse under very cold water to stop the cooking process. Drain and set aside. 2. Mix together the softened butter and the minced garlic. Spread some of the butter mixture on the bottom of each split roll. Spread some mayonnaise over the butter mixture. 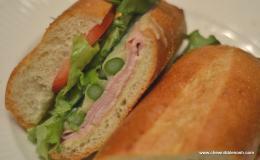 Layer the ham, asparagus and Swiss cheese over the mayonnaise. Place the sandwiches on a cookie sheet. 3. Preheat your oven broiler. Broil the sandwiches for 2 minutes, about 2 inches away from the heat, until the cheese melts. Top with lettuce and tomato, and use salt and pepper to taste. Top with the other half of the roll. Cut the sandwiches in half diagonally and serve. I don't know what made me think of it the other day, but I suddenly remembered FHB. Do you know what that is? When I was a youngster, and my parents invited people for a meal, I was always told we should practice it. Family Hold Back. I suppose there wasn't a lot of food and we were supposed to let the guests have plenty before we did. Never seemed reasonable to me. I always thought the family shouldn't have to do that. Funny how odd memories, like that, come to you. Incredible, yesterday, being Father's Day, my inbox was littered with ads for stuff for father. One ad even included a genuine velociraptor claw. It was only $12.5 K. I'm assuming that is for thousand. I immediately thought of Alex J. Cavenaugh, I though you would be bound to want one. In all honesty I cannot think of any father of my acquaintance who would want to receive a velociraptor today. I don't know of anyone in that business of course. But really, what a peculiar thing to offer amongst all the sweaters, watches and gadgets!! They say it's genuine. I can only suppose it's a joke and they are not really selling them. Surely they belong in a museum? 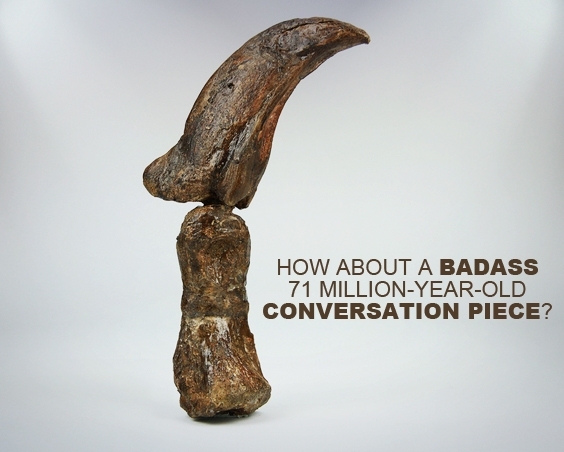 They certainly would be a conversation piece. Matt spoke to his daughters on the phone for father's day. It is a pity they are so far away and we are no longer able to visit England. There were obviously kids visiting their grandparents here at one point and it was rather pretty, they were blowing bubbles which were floating up past our balcony. A long time since I did that or were with kids who blew bubbles. This was not the recipe I was going to use, I have one which is in my cookbook programme. Unfortunately, one cannot export the pictures from it (or I don't know how to) and I cannot, for the life of me, find the origin of the picture in my programme. However, this sounded pretty good. A delightful east meets west appetizer. * Rinse the asparagus then cut in half. Remove the hard parts. * Mix soy sauce, sesame oil, sugar, garlic, ginger, salt and pepper. Marinade the beef for at least 10 minutes. * Wrap the beef around each three baby asparagus. Secure with a toothpick. * Put a little sesame oil in pan, then cook both sides of the asparagus wraps for 3-5 minutes. The asparagus should not be too soggy. * Put in a plate, remove the toothpick. Drizzle with a little bit of sesame oil, and sprinkle some toasted sesame seeds and Japanese chili powder. OK, those of you who do not like asparagus, here is a break from the monotony. Mind you we only have a couple of weeks to go on the asparagus front. 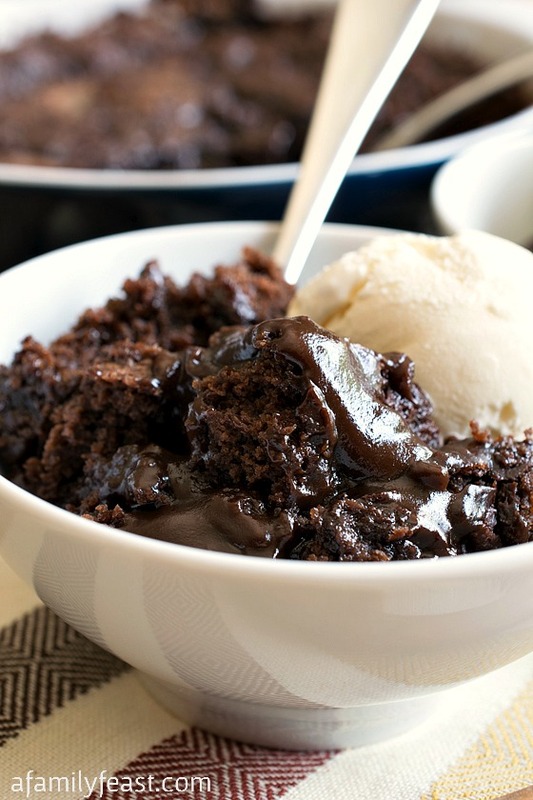 I picked up the link for this recipe from Hershey's Kitchens, but it seems like a lot of bloggers have used it. It looks positively sinful. Of course I would use cream (preferably Double Devon) rather than ice cream but that is a matter of choice. Preheat oven to 350 degrees. Heat a pot of water on the stove to very hot (just under a simmer). Pour the batter into an lightly greased 2-quart ceramic dish (as shown in our photos) or a 9-inch square baking pan (if it's a non-stick pan, you don't have to grease it) and spread evenly. Well, Thursday we bowled again. I am still maintaining a good game at the moment although Matt did beat me a couple of times which meant he was bowling a lot better. He gets really down in the mouth otherwise. Even the owner said he prefers this Matt (bowling well) to the other one. I showed you a picture of my new earrings. Today I wore them with a pair of amethyst studs we bought in northern Ontario at the amethyst mine. I also wore my two amethyst rings plus most of the time I have a lump of amethyst as a pendant around my neck. You could say I was dripping with amethysts today. 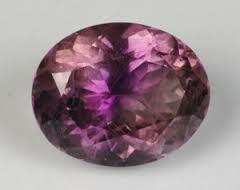 It's not even my birthstone although it is Matt's. One of the rings we also bought at the Ontario amethyst mine. Fascinating place, only ever been there once but the mine actually tunnels under a lake and you can try digging for stones if you wish. It is about 40 years since we visited. Our first vacation in Canada we went up north. We bought a lump of amethyst rock too which ended up in one of our aquariums (we used to have 6) and I think we let it go when we sold the aquarium, I don't really remember. The picture of the polished stone looks like my ring which I bought from a friend who used to make jewellery; again, close to 40 years ago. I suspect the one in the picture is somewhat larger than mine although it is quite a chunk. 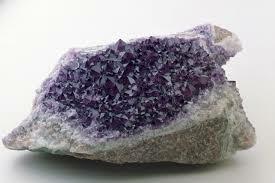 In 2012 I invited Sia McKye to do a guest post and she chose to write about amethysts. Treat the family to a bistro favorite: a tasty bruschetta made with fresh asparagus spears layered on toasted ciabatta bread with cream cheese and arugula. 2. Toss asparagus with 2 tsp. oil; spread onto rimmed baking sheet sprayed with cooking spray. Place bread slices in single layer on second baking sheet. 3. Bake asparagus and bread 8 min. 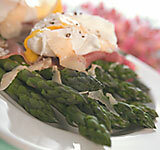 or until asparagus is crisp-tender and bread is toasted, turning all pieces after 4 min. 4. Mix cream cheese spread, feta and 2 tsp. of the remaining oil until blended. Toss arugula with lemon zest and remaining oil. 5. 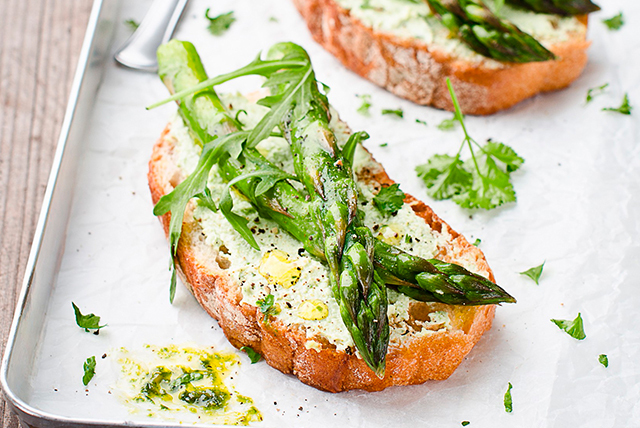 Spread toast slices with cream cheese mixture; top with asparagus and arugula. For more tender asparagus, bake an additional 2 to 3 min. before placing over the toast slices. Hulling Strawberries. Bowling, New Earrings. I saw a video on the internet a couple of days ago about hulling strawberries with a plastic straw. I had tried it once without any luck. However, it showed taking off the greenery, then inserting the straw at the bottom end and pushing through. So I thought I would try again. Now done it for two batches, bit difficult at first but now I have the hang of it, it's easy peasy. Mind you if you are not careful the hulls go right through the straw and drop in unwanted places. Strawberry can stain so you don't want it dropping on clothes or carpets. Hm, this isn't the same video and the guy doesn't even remove the greenery. I have another punnet to do for tomorrow so I can try it without removing the leaves.. I am so glad it works as it looks so easy when they do it and I think I was trying to do it the wrong way round. I believe people do this with cherries too. Tried that but couldn't get it to work. Supposed to work with olives too. Guess I should persevere. but I'm glad it has. Poor Matt is still in the doldrums I'm afraid. Mind you I nearly didn't get my cup of hot chocolate because of it. The alley owner said it might spoil my game (usually we figure it helps) but I had done so well in the first. However, I was already into the second game and not doing well so the hot chocolate didn't make any difference when it arrive. I got a mediocre score but then for the third game I bowled really well again. I am thrilled to bits about this but it doesn't necessarily last I'm afraid. I just received a pair of earrings from Amazon.ca which I ordered for Matt to give me as a birthday present. Well part of anyway, he doesn't know that yet though LOL. They are silver, set with amethysts. I wasn't quite sure they wouldn't be too small, but they appear to be fine. I haven't tried them on yet. Officially I shouldn't even have them until September mind you. Matt thinks I have too many pairs of earrings as it is, but I enjoy wearing them. This recipe was sent to me by a friend in Australia. Whilst she herself doesn't particularly like asparagus, unless it's extremely thin, she knows I do. I assume everyone that knows me is aware of my love for asparagus. Combining delicate ribbons of fresh asparagus with a delicious cheesy tart filling, this puff pastry delight will win your heart as well as your tastebuds. Preheat your oven to 160°C and grease a loose-bottomed tart tin (shape doesn’t really matter, just ensure it’s about four to six-cm deep). In a bowl or jug, whisk the eggs together. Add the milk and whisk again. Line the tin with your puff pastry and sprinkle a little grated cheese over the base. Lay the asparagus into the tin and pour the egg mixture over the top along with the remaining cheese (do this slowly – depending on the size of your tin, you may not need all of the mixture). Bake the tart for 15 to 20 minutes, or until the pastry is puffed and golden, and the egg mixture is set. I am always looking for new recipes and I checked a book on vegetables that I have had since time began. Never looked at it much and certainly not for asparagus. Not a bad recipe in there, but it tells you how to cook asparagus. Tie it up in a bundle, stand upright (heads out of water) and boil for 25 minutes. Horrors, 25 minutes what on earth would you have at the end of that time? Mush? I have tried cooking them standing upright but I wasn't impressed. 3 minutes in boiling water seems to work very well for me. 25 minutes, can't get over it. stepping outside. I would be glued to the air conditioning. We were in Pennsylvania once in our travel trailer and it was 103°F. All the people on the campsite were taking their chairs and sitting in the stream keeping their feet wet - until someone saw a snake. I can't remember if that was the time when we didn't even have a/c in the car. We drove the New Jersey turnpike and had to keep the windows shut because we were surrounded by traffic, particularly trucks, and the air was horrendous but then it was pretty horrendous inside the car too. Not necessarily on the same trip you understand. We used to spend a fair amount of time at the beach. Today I would not go into the water. These recent shark attacks happened in relatively shallow water. A friend said she was going to the beach for the 4th I recommended she and her family stay out of the water. It really isn't worth it. 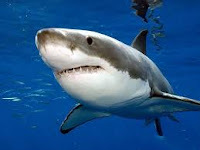 I gather the sharks are migrating at the moment and this is part of the trouble, I've also heard they are evacuating the beaches. Wednesday is league bowling again, It seems such a long time since last Thursday. This recipe was demonstrated on local TV (Canada AM) the other day and featured a chef called Rose Murray who buys her asparagus from Barrie's. I thought it looked delicious but hunting for a picture, I found it was not original to her although she may have made adaptations. 1. In a small bowl, whisk together the shallots, hazelnuts, hazelnut oil, vinegar and mustard. 2. 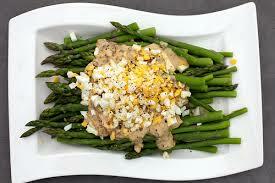 Transfer the hot, freshly roasted asparagus to a warm platter and spoon the dressing over the top. Toss gently to coat the asparagus with the dressing. Tigers, Weight Watcher Soups, Asparagus. I learned this from How to Geek this morning. 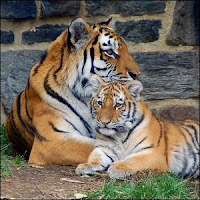 The country with the most tigers is - the United States. I quote: This staggers me. The country with the largest tiger population isn’t India, China, Russia, or any of the Eurasian countries that currently occupy the ancient ranges of the massive cats. The country with the largest tiger population is the United States. It’s not because there is a secret enclave of feral tigers deep in the steamy Everglades or snow tigers lounging atop the Rocky Mountains, but a result of zoos, conservatories, and private ownership of tigers. The private ownership is so extensive that the estimated population of tigers within the United States (5,000 animals) is significantly higher than the total global population of wild tigers (3,200). They asked their readers to pick out the country with the most tigers and both China and Russia were on the list. It would never have occurred to me to pick the USA. 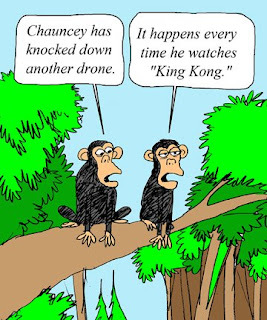 Zoos and conservatories are one thing, but private owners in the States worry me, there have been quite a few reported accidents. The latest being the zoo where the town has been flooded out and there are now wild cats roaming around free. OK, not a private ownership, but that was a tad unusual. cookbooks. I made several things from them but one we both really liked was a Cream of Celery soup. Trouble was, these days I don't have dried milk in the house. However, I chopped up a whole bunch of celery, having washed it first of course, cooked it in stock with 3/4 pint water (that's an English pint which is 20 oz.) and once it was very tender whizzed it up in the blender and then added a little skim milk. Tastes fine and we had it for supper on Monday followed by some Brie. The hardest part was getting it tender. I thought it wouldn't take long, I was wrong, I simmered it for at least half an hour, maybe more. 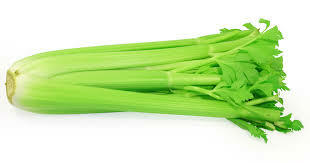 One thing I did forget was to peel the celery. The soup was delicious but a tad stringy. There are other simple soups so I will have to have a go at some of them. Dried milk occurred in a lot of WW recipes in those days. There is also a delicious recipe for Skate, but I have never seen that fish here. Tuesday I will be going for my asparagus run with orders from a lot of friends. Then only two more trips and that will be the end of it for this year. 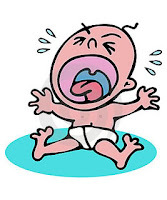 Boo hoo. I've learned a couple of things about it such as storing it, standing, in water like flowers because it is related to the lily. I am assured that asparagus love water. Not sure I have mine long enough for them to need it. I have no idea where this recipe came from and I don't have a picture for it. Perhaps I had better make it so that I will have one in the future, although, knowing me I would forget to take the picture. I wouldn't use white asparagus because it wouldn't be fresh enough. There isn't anywhere close to me that grows it so buying it in the store I would end up with woody stems. I have only tried white asparagus once and was very disappointed. I am told it needs a sauce, yes it does, regular green asparagus can be eaten plain and enjoyed. I choose green. The picture below is exactly what it looks like when I buy it from the farm. Tomato concassé is very easy to make, peel tomatoes by dipping them in boiling water for a few seconds, the skins will slip off. Then de-seed them and rough chop the rest of the tomato flesh. Chop some shallots and gently sauté the tomatoes and shallots together in some butter. Set aside until ready to use. 1. Peel ends of asparagus, tie and boil til tender. Cut off tops, chop up bottoms having removed woody bits. Mix bottoms with tomato concassé, chervil, sieved egg white, olive oil, lemon juice and season with salt and pepper. 2. Sprinkle spears with lemon juice and olive oil, season. In a piping tube stand up spears all round, fill with salad, tie up with blanched chive then gently remove piping. Sprinkle with sieved egg yolk. Decorate with chervil leaves. Immortal Beloved, Michael Bond, CBE, Asparagus. Cane, Bees, Stupid Question, Baseball. Popcorn, Rhino News, Bowling, This and That. Encouraging Thunder, Toilet Roll, Storm. Shot Black Bear, Death by Lion, Bowling. Jeopardy, Rain, Solar Impulse Plane.